Sat., Oct. 1, 2016, 10 a.m.
DEAR TIM: My husband has been hinting about wanting an impact driver. He claims there are many uses for it around the house. I wonder if he’s trying to pull the wool over my eyes and just get another expensive toy. What’s your feeling about this tool that just looks like a drill to me? – Melanie H., Apple Valley, Calif.
DEAR MELANIE: I can understand your skepticism. Some people just want every new shiny object that hits the marketplace. This disease afflicts both women and men equally, I feel. The good news is that your husband is hankering after something that’s more than just moderately useful. I own more than one impact driver, and this tool is absolutely one of the top five power tools the average homeowner should own. I only wish they were available decades ago when I was still building 60 hours a week. My productivity would have gone through the roof! If you’ve never used or held an impact driver in your hand, the best way to describe one is to think about the tool auto mechanics use to remove the lug nuts from a car wheel. Have you ever heard that high-pitched whizz noise and rat-a-tat-tat as the lug nut spins off or is tightened by the air-powered impact driver? This reliable technology that’s been around for years was transferred to the pro and DIY power tool marketplace not too many years ago. These marvelous tools can be used for so many things as long as you get the right one. Even though many look the same, there’s a lot of difference between some of these tools. I prefer the cordless impact drivers because they’re so versatile. Who wants a power cord dragging around if it’s not needed? 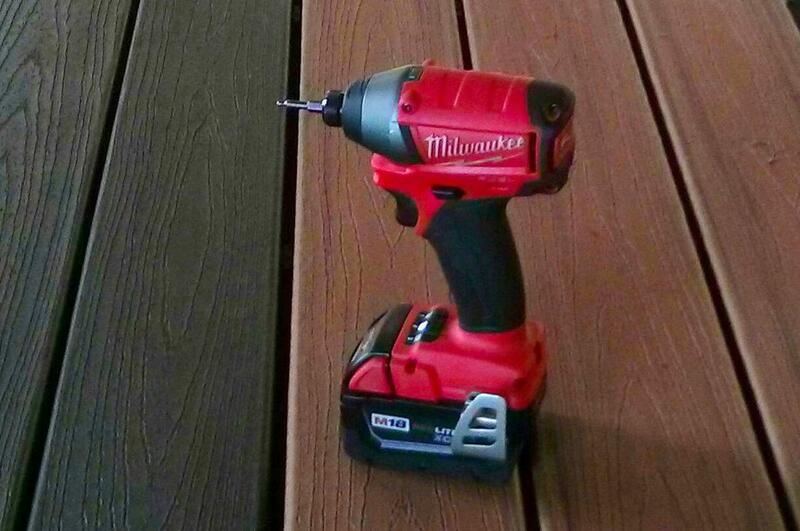 My favorite impact driver is made by Milwaukee. It has a brushless motor, a 1/4-inch hex drive and three different torque settings. The torque power settings range from 200 to 1,600 inch-pounds of torque. Believe me, that’s more than enough to drive giant 3/8-inch long lag screws into hard yellow pine. There are different voltages you can get with cordless power tools. I happen to be a fan of 18-volt tools, but I probably expect more out of my tool than a casual weekend warrior. There are 12-volt impact drivers that deliver plenty of punch and will drive or remove many fasteners with just one charge of the lithium-ion battery. Here’s just a partial list of some of the jobs this tool will accomplish. I recently used mine to remove screws that held a deck railing in place. The tool also did a remarkable job of removing large lag bolts that held railing posts in place. I used the driver to install giant 5-inch-long timber screws through solid lumber. My impact driver works well for smaller fasteners too. When you need extreme control to drive small hidden fasteners in between expensive composite decking, then come and borrow my impact driver. I just finished driving hundreds and hundreds of tiny stainless steel screws that are part of the hidden fastening system for my Trex decking. Using the No. 2 torque setting delivered the perfect amount of torque so as not to snap off the screws. The hex drive system allows you to use the tool with any number of fasteners. Imagine if you need to drive Phillips-head screws. How about hex-head screws? Do you have to drive Torx screws or square-drive fasteners? All of these fasteners can be expertly driven into wood, steel or any material with precision using a high-quality impact driver and an assortment of hex-shaft bits. Don’t try to compare an impact driver with a screw gun. The inner mechanics of each tool are radically different. Impact drivers deliver tiny bursts of power that make a much bigger difference in trying to both drive and remove fasteners. When using an impact driver, it’s really important that the bit you’re using is a perfect match for the fastener. If there’s the smallest amount of slop in the fit, either the bit or the fastener will get almost always get rounded and ruined as the tool spins rapidly while the fastener doesn’t. If your husband has not used an impact driver, I feel it’s best to have him practice driving different fasteners in scrap pieces of lumber to really get a feel of how the tool works. It’s important not to overdrive certain fasteners. He’ll also discover that, when driving into wood, the wood species makes a big difference. Harder woods can cause fasteners to snap with little warning. I urge you to try the tool, too. I believe once you see how amazing an impact driver is, you’ll be glad you approved the purchase. It saves so much work and takes so much stress off your wrists and hands. Keep in mind that the more expensive impact drivers usually have better parts, better engineering and can last generations if cared for. Published: Oct. 1, 2016, 10 a.m.